A nice, quiet church tucked inside Barangay West Triangle and near the home of Ninoy Aquino and former president Cory on Times St. Hearts of Jesus and Mary Parish not air-conditioned but is not hot either due to sufficient ventilation. 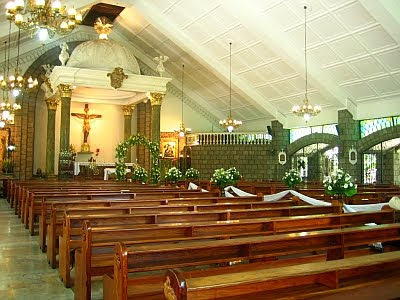 It's a great location for weddings, in fact it's the most booked church for weddings in the Diocese of Cubao. Ample parking for guests and parishioners available on the streets of the subdivision. Tutubi sometimes hear Sunday masses here with schedules even at 12 noon. Commute to Hearts of Jesus and Mary Church: From MRT Quezon Avenue station, board a jeepney going to Pantranco or Quiapo and alight at the corner of Examiner St (McDonalds and Pancake House) then walk towards your right for two blocks, left on Bulletin St then right Daily Mirror St where the church is located (access of Bulletin St sometimes is closed so it may sometimes be better to enter via West 4th St (opposite Scout Borromeo). It can also be reached by jeepneys bound for Fairview from Quiapo. Driving directions to Hearts of Jesus and Mary Parish: From Makati, head towards EDSA going to Quezon City, make a U-turn under Quezon Avenue viaduct then turn right on Quezon Avenue. Turn right on Examiner St (McDonalds and Pancake house are landmarks), left on Times St (the first corner after Quezon Avenue) right again on West 4th St, right on Bulletin St then left on Daily Mirror St. The parish is located just beside the barangay hall of West Triangle.